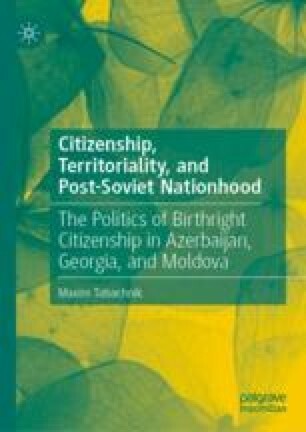 This chapter describes the significant impact of historically-constructed concepts of national identity on the politics of jus soli and territorial citizenship in general in Moldova, Azerbaijan and Georgia. It could be even argued that these concepts stretch back into pre-modern times. They testify to the degree that history matters greatly for the politics of both national identity and citizenship, even in such new states with practically no history of independent statehood, such as Moldova and Azerbaijan. In all three cases, it is clear that historical concepts of national identity weigh heavily on today’s politics of national identity and citizenship. The history of collective identity in Georgia predisposed it to the rejection of territorial nationalism and jus soli while the lack of differentiated ethnic consciousness in Moldova and Azerbaijan have led, directly or indirectly, to the opposite results – widely-accepted territorial concepts of the nation and unconditional jus soli. Agenda publică. 2013. Institutul Român pentru Evaluare şi Strategie. http://www.ires.com.ro/uploads/articole/ires_agenda_publica-1_decembrie_2013.pdf, accessed May 21, 2015. Aliyev, Ilham. 2012. Welcoming Speech at the Opeining of the Second Baku International Humanitarian Forum. Official Website of the Baku International Humanitarian Forum. http://www.bakuforum.org/en/speech2012/, accessed December 9, 2014. Cărăuş, Tamara. 2005. The Role of the Nation-State in the Resolution of Interethnic Porblems in Moldova. In Ethnobarometer in the Republic of Moldova. Pp. 81–111. Institute for Public Policy. http://www.ipp.md/libview.php?l=en&idc=163&id=76, accessed May 15, 2015. Catană, Vitalie. 2005. Citizenship and National Identity in Moldova. In Ethnobarometer in the Republic of Moldova. Pp. 112–135. Institute for Public Policy. http://www.ipp.md/libview.php?l=en&idc=163&id=76, accessed May 15, 2015. Corso, Molly. 2009. Georgia: Church-State Separation Becomes an Issue amid Government Financial Support for Georgian Orthodox Church. Eurasianet.Org. http://www.eurasianet.org/departments/insightb/articles/eav040609b.shtml, accessed July 20, 2017. Corso, Molly. 2013. Georgia: What’s the Definition of Tolerance? Eurasianet.Org, September 6. http://www.eurasianet.org/node/67473, accessed August 9, 2015. Demographic, National, Language and Cultural Characteristics—Population Census. 2015. National Bureau of Statistics. http://www.statistica.md/pageview.php?l=en&id=2234&idc=295, accessed May 20, 2015. Dinu, Dragos, and Octavian Milevski. 2014. Strenghtening Cooperation on the Romanian Minority Issue in Post-Euromaidan Ukraine. Bucharest, Romania: Romanian Center for European Policies. http://www.crpe.ro/en/wp-content/uploads/2014/03/Policy-Brief-38-Romania-Ukraine-Cooperation-on-minority-issue-post-Euromaidan.pdf, accessed June 1, 2015. Georgia Reveals Initial Data from Country’s First Census in 12 Years. 2015. GeorgianDay. http://www.georgianday.com/#!Georgia-reveals-initial-data-from-country%E2%80%99s-first-Census-in-12-years/cjds/5544cfb10cf2836c880f80f4, accessed August 14, 2015. Hadjy-Zadeh, Hikmet. 1996. Azerbaijan: In Search of a National Idea. http://www.zerbaijan.com/azeri/hhz7.htm, accessed December 9, 2014. Handrabura, Loretta. 2005. Ethnic/National Identity and Self-Identification of Ethnic Groups in the Republic of Moldova. In Ethnobarometer in the Republic of Moldova. Pp. 219–239. Institute for Public Policy. http://www.ipp.md/libview.php?l=en&idc=163&id=76, accessed May 15, 2015. Javakh Armenians Want Visiting Armenian Parliament Prez to Get Them Permanent Georgian Residency Status—Hetq—News, Articles, Investigations. 2014. HETQ. http://hetq.am/eng/news/56710/javakh-armenians-want-visiting-armenian-parliament-prez-to-get-them-permanent-georgian-residency-status.html, accessed August 29, 2015. Lozinschi, Raisa. 2008. SRL “Moldovanul”. Jurnal de Chisinau. http://web.archive.org/web/20080822105104/http://www.jurnal.md/article/2726/, accessed May 14, 2015. Moldova National Voter Study. 2011. Chisinau, Moldova: International Republican Institute and the Gallup Organization. http://www.iri.org/sites/default/files/flip_docs/Moldova%20national%20voters%20survey%202010-09/HTML/index.html#/34/zoomed, accessed May 21, 2015. Myhill, John. 2006. Language, Religion and National Identity in Europe and the Middle East: A Historical Study. Discourse Approaches to Politics, Society, and Culture, v. 21. Amsterdam and Philadelphia: John Benjamins. http://site.ebrary.com/lib/ucsc/Doc?id=10132058, accessed February 21, 2013. Narodetskiy, Oleksandr, and Olena Chekan. 2011. Oleg Kalugin: “Putin Is a Temporary Twist In History.” The Ukranian Week, September 8. http://ukrainianweek.com/World/30378, accessed August 9, 2015. National Bureau of Statistics of the Republic of Moldova. 2015. Statistica Moldovei. http://www.statistica.md/index.php?l=en, accessed May 14, 2015. Nodia, Ghia. 2011. Georgia’s Showdown Between Church And State. RadioFreeEurope/RadioLiberty, February 20. http://www.rferl.org/content/commentary_georgia_churches/2314963.html, accessed August 9, 2015. Opinion Poll Data—Azerbaijan and Georgia. 2013. Caucasus Barometer. http://caucasusbarometer.org/en/cb-az/MARWARM-withoutdkra/, accessed April 27, 2015. Petruţi, Doru. 2005. An Empirical Model of Interethnic Relations Reflected in the Ethnobarometer. In Ethnobarometer in the Republic of Moldova. Pp. 9–52. Institute for Public Policy. http://www.ipp.md/libview.php?l=en&idc=163&id=76, accessed May 15, 2015. President of Romania, Called Time of Unification with Moldova. 2010. Newspepper.Su. http://newspepper.su/news/2010/11/30/president-of-romania-called-time-of-unification-with-moldova/, accessed May 19, 2015. Primul manifest ştiinţific împotriva conceptului de limbă moldovenească. 2008. Amos News. http://www.amosnews.ro/arhiva/primul-manifest-stiintific-impotriva-conceptului-limba-moldoveneasca-05-03-2008, accessed May 15, 2015. Rukhadze, Vasili. 2015. The Latest Census Underlines Georgia’s Profound Demographic Crisis. Eurasia Daily Monitor, May 12. http://www.jamestown.org/programs/edm/single/?tx_ttnews%5Btt_news%5D=43902&cHash=5f0cb174cefd2dadad8b47b4ceb959ed#.Vc1BcLdrWtE, accessed August 14, 2015. Shissler, Ada Holland. 2003. Between Two Empires Ahmet Aǧaoǧlu and the New Turkey. London: I. B. Tauris. http://site.ebrary.com/lib/ucsc/Doc?id=10132924, accessed December 30, 2014. Socor, Vladimir. 2007. Official Chisinau Seeks Recognition of Moldovan Ethnicity and Minority in Romania. Eurasia Daily Monitor. http://www.jamestown.org/single/?tx_ttnews%5Btt_news%5D=32532&no_cache=1#.VVU6vetDn8E, accessed May 14, 2015. Suny, Ronald Grigor. 1993. The Revenge of the Past: Nationalism, Revolution, and the Collapse of the Soviet Union. Stanford, CA: Stanford University Press. http://quod.lib.umich.edu.oca.ucsc.edu/cgi/t/text/pageviewer-idx?c=acls&cc=acls&idno=heb05391.0001.001&node=heb05391.0001.001%3A6&view=image&seq=80&size=100, accessed September 14, 2015. Supporters of Unification with Romania Rally in Moldovan Capital. 2015. BBC Monitoring Kiev Unit Supplied by BBC Worldwide Monitoring, May 18. http://www.lexisnexis.com.oca.ucsc.edu/lnacui2api/api/version1/getDocCui?lni=5G15-C4Y1-JC8S-C36T&csi=270944,270077,11059,8411&hl=t&hv=t&hnsd=f&hns=t&hgn=t&oc=00240&perma=true, accessed May 21, 2015. Tension Grows Between Moldova and Romania. 2009. EurActiv. http://www.euractiv.com/east-mediterranean/tension-grows-moldova-romania-news-221678, accessed June 3, 2015. The Virtual Jewish World: Azerbaijan. 2014. Jewish Virtual Library. http://www.jewishvirtuallibrary.org/jsource/vjw/Azerbaijan.html, accessed December 30, 2014. World Population Data Sheet. 2012. United Nations Population Reference Bureau. http://www.prb.org/pdf12/2012-population-data-sheet_eng.pdf, accessed December 11, 2015. Армяне в Баку. 2015. Baku.Am. http://www.baku.am/armenians-in-baku, accessed January 8, 2014. Депутаты хотят переименовать Азербайджан. 2012. Правда.Ру. http://www.pravda.ru/news/world/02-02-2012/1106806-azerbajdzhan-0/, accessed February 25, 2015. Конституционный Суд Постановил Признать Молдавский Язык Румынским. 2013. Фонд Горчакова. http://gorchakovfund.ru//news/9411/, accessed May 20, 2015. Мехтиев, Рамиз. 2011. Азербайджанская национальная идея отличается своим содержанием, универсальностью, гуманностью, гибкостью и естественностью. Day.az. November 16. http://news.day.az/politics/299115.html, accessed April 26, 2015. Морарь, Наталия. 2009. План Белковского: 5 лет спустя. Новая Молдавия. http://www.moldovanova.md/ru/publications/show/280. Патрашко, Мария. 2010. Молдавский язык — отдельный язык или лингвоним румынского языка? Social-Anthropology. ru. http://www.social-anthropology.ru/node/69, accessed May 19, 2015. Президент Румынии назвал объединение с Молдовой новым фундаментальным проектом. 2013. Зеркало недели | Дзеркало тижня | Mirror Weekly. http://zn.ua/WORLD/prezident-rumynii-nazval-obedinenie-s-moldovoy-novym-fundamentalnym-proektom-133755_.html, accessed May 21, 2015. Решение КС Молдовы о румынском языке не будет иметь никаких юридических последствий для страны. 2013. NewsCom.md. http://www.newscom.md/rus/reshenie-ks-moldovi-o-ruminskom-yazike-ne-budet-imet_-nikakih-yuridicheskih-posledstvij.html, accessed May 20, 2015. США подтвердили план слияния Ирана с Азербайджаном. 2012. Rosbalt.ru. http://www.rosbalt.ru/exussr/2012/08/28/1027390.html, accessed February 25, 2012. Флоря, Ксения. 2014. Не перепишитесь сами – вас перепишут. Noi.md. http://www.noi.md/ru/print/news_id/40551, accessed June 1, 2015.